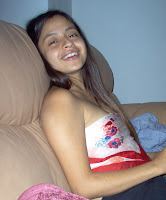 Lily Aramburo Case on America’s Most Wanted Tonight! Friends and supporters, I am so very excited to announce that Lily Aramburo is being featured TONIGHT (Saturday September 12th) on the 23rd Season Premiere of America’s Most Wanted at 9pm (Eastern time). The video we submitted included shots of Lily’s mom, Lucely, Private Investigator Joe Carrillo and his partner Ana Lanuza in front of the house we think Lily may have been last, which is in Coconut Grove, Florida. I’ve been working diligently to get media coverage for Lily over the last 2 years. It’s been a real struggle. But it wasn’t that difficult with AMW. They gave us an opportunity to reach out to the community for help. 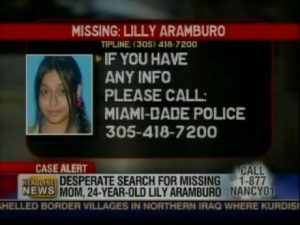 Please help us find Lily. Someone out there knows what happened. Please call AMW’s confidential hotline at 1-800-CRIME-TV. We are very grateful to America’s Most Wanted for the coverage. THANK YOU so much! And thanks to all our friends and supporters. Thank you for caring, for keeping Lily in your mind and prayers. Never give up on her, someone knows something. 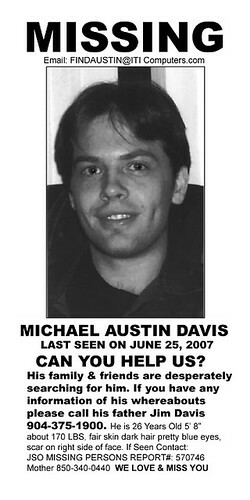 Michael “Austin” Davis, age 26, has been missing from the Argyle area of Jacksonville, Florida since June 26, 2007. He was suffering from depression. It is devastating when a loved one goes missing. But to learn about the purchase of a shot gun? Not easy to deal with at all. Let’s hope someone comes forward with information. Take a look at the video below. 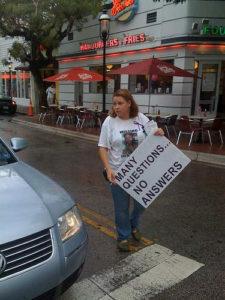 It’s Austin’s sister, Anita describing the circumstances surrounding Austin’s disappearance. Height 5′ 8″ / Weight 180 lbs. Jacksonville, FL, October 18, 2007 – Jacksonville Sheriff’s Office has released information regarding the disappearance of Michael “Austin” Davis, 26, from his Westside home on the morning 0f June 26, 2007. “We now know,” said Anita Sullivan, sister of the missing man, “that Austin’s mysterious taxi ride ended at Jax Jewelry and Pawn Shop at the intersection of 103rd Street and Blanding Boulevard around 12:30pm on June 26th. JSO has confirmed Austin bought a shotgun there and the clerk said he put the gun in a duffle bag and left the shop on foot. “We have searched the area but found nothing”. “The pawn shop clerk said the gun barrel was protruding from the duffle bag when he left the shop. As busy as that area is midday, we think it is likely someone saw him and would remember something as unusual as a young man walking on Blanding or 103rd with a gun in a duffel bag”, the missing man’s sister said. “We are hopeful someone will come forward, possibly with information regarding his direction of travel and help us target other areas to search”, Anita Sullivan said. Anyone who may have seen a man walking with a duffle bag on the afternoon of Tuesday, June 26 in the area of Blanding Bvd. and 103rd Street, which includes Wesconnett Blvd., Timuquana Road, Jammes, and surrounding areas, is urged to step forward. He may have been walking in any direction, and may have been seen on side roads up to several miles away from the intersection. Anyone with information is urged to contact the Jacksonville Sheriff’s Office. For the full story please visit the Find Austin Davis Website. 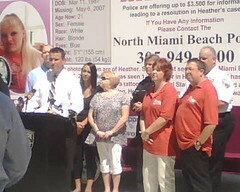 This case pulls at my heart strings because Austin disappeared in June 2007, just like Lilly. The family has been waiting for answers as long as we have. The month of June will never be the same for us.